For a dedicated golfer intent on continually improving their game, nothing is more discouraging than losing valuable practice time because of the rare day of inclement weather. Say goodbye to bad weather blues and say hello to the pair of indoor hitting bays at Frederica Golf Club. Roll-up doors in the bright, spacious bays bring the tee box inside on rainy or windy days. Nets drop down to contain the golf balls for hitting on soggy days. Heaters knock off the chill, and when the weather clears, step out onto a grass hitting surface that offers targets ranging from greens to driver-length routes through live oaks. Each bay’s four-way camera system records your swings from all angles. Your swing is analyzed through VI Pro software and is played back through large-screen HD televisions. SAM Balance Lab: Step onto the balance board packed with 2,500 sensors, take a swing and learn how your weight distribution changes at every phase of your swing. The swing is simultaneously recorded allowing swing and balance information to replay in sync. SAM Balance Lab is available in both indoor hitting bays. FlightScope X2: This golf ball tracking system provides real-time shot statistics and performance reports for club, ball and golf swing performance. Flightscope's Doppler radar can be used indoors or outside — an invaluable tool for precise club fitting and instruction. SAM Putt Lab: When combined with the industry's best indoor putting turf, the SAM Putt Lab is unsurpassed in providing data to correctly fit members to a putter. It also provides an insightful 28-point analysis of your putting stroke and performance with different putters. TrackmanPro Technology and Club Fitting: Offering precision swing and ball flight analysis measured via radar technology, TrackmanPro measures the full trajectory of any golf shot. Members can improve their games and arrange for custom club fittings using TrackmanPro. Whether you are an amateur or touring professional, the high tech analysis provided by all of the Learning Center tools can provide the data you need to shave strokes off the scorecard. Need a recommendation for club-fitting or purchase? Frederica Golf Club is an authorized dealer of all the major manufacturers, and our professional staff is certified to fit you with a perfectly matched set of clubs. Club repair and alteration can be done on-site. Repair facilities are equipped with industry-leading equipment for fine tuning the loft and lie of every club in your bag — from drivers and irons through your putter. Grip changing and minor repairs get you back on the course in factory fresh condition. 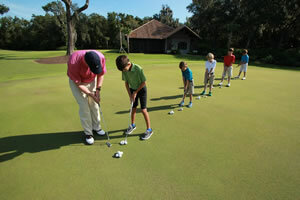 Staff knowledge, incredible technology and easy access to unique practice facilities is what sets Frederica Golf Club’s Learning Center apart from other private golf communities.